Resources - a collection of information models that define the data elements, constraints and relationships for the “business objects” most relevant to healthcare. From a model-driven architecture perspective, FHIR resources are notionally equivalent to a physical model implemented in XML or JSON. See the formal definition. APIs – a collection of well-defined interfaces for interoperating between two applications. Although not required, the FHIR specification targets RESTful interfaces for API implementation. See details on FHIR RESTful interfaces. In the healthcare domain, the set of “business objects” is not universally defined, but there is a notional and ongoing evolutionary, consensus-based process for standardizing on a core set of common business objects including things like “a patient”, “a procedure”, “an observation”, “an order”, etc. (see a list of defined resources). 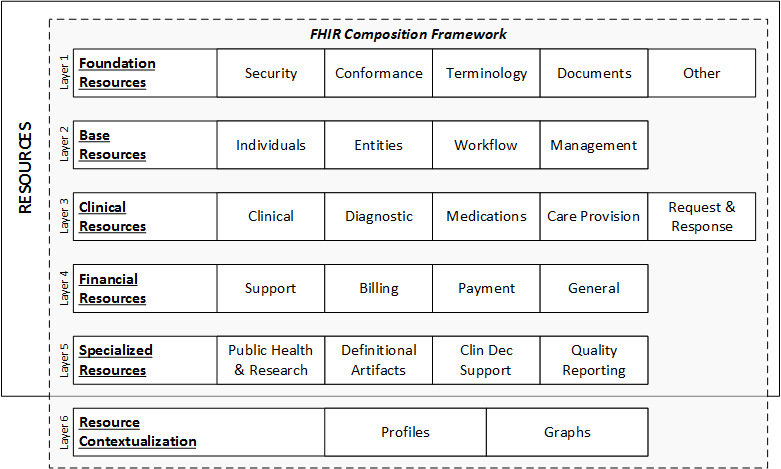 The FHIR specification provides a framework for defining these healthcare business objects (“resources”), for relating them together in a compositional manner, for implementing them in a computable form, and for sharing them across well-defined interfaces. The framework contains a verifiable and testable syntax, a set of rules and constraints, methods and interface signatures for “FHIR-aware” APIs, and specifications for the implementation of a server capable of requesting and delivering FHIR business objects. From an operational perspective, HL7’s internal standards development and governance processes determine what constitutes a resource and which resources exist. In addition, the FHIR specification also provides a mechanism for contextualizing resources for specific needs within specific bounds (see Profiling Resources). FHIR resources fit firmly within the information architecture domain and the FHIR APIs for data exchange address aspects of application architecture. From a TOGAF perspective , FHIR addresses aspects of architecture views related to information model definition and data exchange, which are described in the Information Systems Architectures portion of the TOGAF Architecture Development Method. When considering the HL7 Services Aware Interoperability Framework (SAIF) , FHIR resources and RESTful APIs represent the “Physical Models” and “Interface Implementations” within the Platform Specific Specifications layer of the Information Models and the Behavioral Models Viewpoints, respectively. Reuse and Composability – FHIR resources are designed with the 80/20 rule in mind – focus on the 20% of requirements that satisfy 80% of the interoperability needs. To this end, resources are designed to meet the general or common data requirements of many use cases to avoid the proliferation of numerous, overlapping and redundant resources. Extension and customizations exist (see FHIR Profiles) to allow common, somewhat generic resources to be adopted and adapted as needed for specific use case requirements. In addition, FHIR resources are highly composable in that resources commonly refer to other resources. This further promotes reuse and allows for complex structures to be built from more atomic resources. Scalability – Aligning FHIR APIs to the REST architectural style ensure that all transactions are stateless which reduces memory usage, eliminates the needs for “sticky” sessions within a server farm and therefore supports horizontal scalability. Performance – FHIR resources are lean and suitable for exchange across the network. Highly optimized formats are available, which has the potential to improve performance in complex transactions across multiple systems connected via a shared and finite network, though most implementers find the standard JSON / XML formats adequate. Usability – FHIR resources are understood by technical experts and non-technical people alike. Even if the details of XML or JSON syntax are not understood, non-technical people can view these in any browser or text reader and understand the contents within them. Data Fidelity – FHIR is strongly typed and has mechanisms built in for clinical terminology linkage and validation. In addition, XML and JSON documents can be validated syntactically as well as against a defined set of business rules. This promotes high data fidelity and goes a long way towards using FHIR to achieve semantic interoperability. Implementability – One of the driving forces for FHIR is the need to create a standard with high adoption across disparate developer communities. FHIR is easily understood and readily implemented using industry standards and common mark-up and data exchange technologies. There are additional architecture principles related to consistency, granularity, referential integrity, and others that are not as well established or proven. See the section below on Outstanding Issues for details. As discussed, FHIR’s principal components are resources and RESTful APIs. However, there is more to the FHIR specification including the components depicted below. NOTE: The term “component” is used loosely to mean a part of something and does not intend to carry the specific meanings for this term provided by rigorous ontologies, modeling frameworks, or other architectural and organizational constructs. 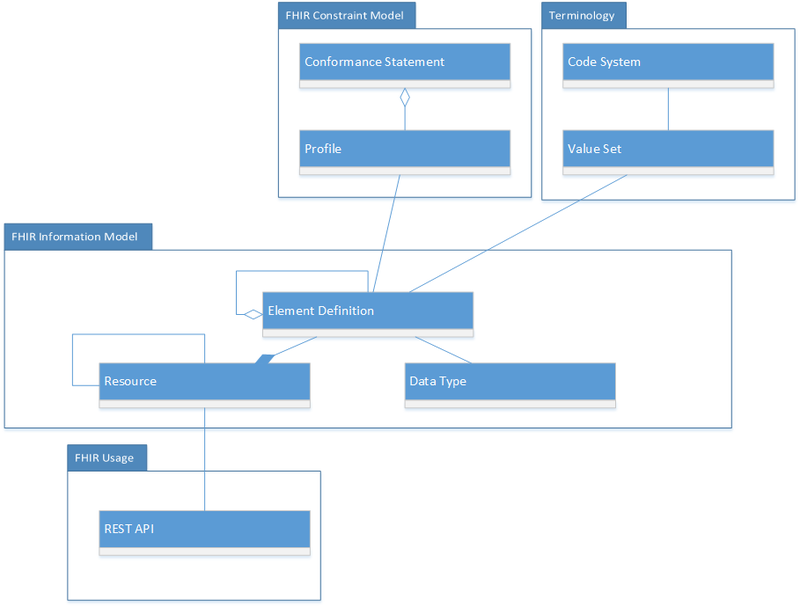 Diagrammatically, the components below are depicted below as UML classes. This is done purely to take advantage of the semantics afforded using this notation. FHIR is neither objected oriented in its modeling approach nor are the components that make up the FHIR specification UML classes or objects in the formal sense. Likewise, the UML packages shown below are notional and used for organizational purposes only. The following list provides general guidelines that apply when FHIR resources are defined. Most of these items are not enforced programmatically requiring human due diligence and governance to ensure adherence. if two different uses of a "resource" would result in wildly different interpretations of what constitutes "core" then that suggests two resources might be appropriate. It is impractical to model the entirety of health data in a single information model. Every modeling initiative in healthcare from HL7 version 2 message specifications to FHIR resources decomposes the healthcare domain into smaller, more manageable sub-domains or information model snippets. With FHIR, each resource is essentially a snippet of the larger healthcare information domain. When breaking down the healthcare information model into smaller chunks (or resources for FHIR), it is important to have a framework and set of guidelines to promote consistency and integrity within the resource structures and in the way resources reference each other. The framework shown below includes health information model sub-categories organized into layers based on their degree of commonness. The layers and categories are useful for identifying which parts of healthcare information are the most common and therefore need to be the most consistently defined and tightly governed. The categories at the top layers are the most common and contain the FHIR resources that support the largest number of common healthcare transactions. Foundation Resources: Foundation resources are the most rudimentary, foundational resources. They are often used for infrastructural tasks. Although not prohibited, they are not always referenced by other resources. Base Resources: Layer two consists of base resources. These are often the leaf nodes of a resource graph. In other words, they are often referenced by other resources, but don't typically reference other resources themselves. These resources are typically the most commonly used, and therefore require the highest degree of consistency and architectural rigor. Governance is greatest for resources in layers one and two. Clinical Resources: Layer 3 includes the resources that are clinical in nature but are also very common across many use cases. This includes resources for clinical observations, clinical treatment, care provision, and medications. These resources can be used by themselves, but typically build on the resources in layer two. For example, an observation resource will reference the patient resource from layer two. These resources are also frequently contextualized when they are referenced by resources in layers three, four and five. Financial Resources: Layer four is dedicated to financial resources. Logically, financial resources build on clinical and base resources. For example, a billing resource will reference clinical events and activities as well as base resources like a patient. Specialized Resources: In layer five, we find more specialized resources for less common use cases. These resources almost always reference resources in lower layers. Given that FHIR places priority on satisfying the most common use cases, there are fewer resources in this layer. Resource Contextualization: Layer 6 does not contain resources. However, it does extend the composition framework made up by the first five layers of resources. Layer 6 includes profiles and graphs. Profiles are used to extend, constrain, or otherwise contextualize resources for a given purpose. Graphs are compositions of resources, or webs of resource, that contain attributes of their own. The complete set of FHIR resources organized against this framework is found on the Resources page. Purposes 2 and 3 set the foundation for future architectural rigor and resource governance to optimize consistency, integrity and predictability of new or refined resources in the future. The actual rules and patterns will be defined and refined in future FHIR releases. However, one general guideline to state now is that resources generally reference resources in the same layer or higher. In other words, a layer 4 resource will typically only reference resources in layers 4, 3, 2 or 1. There is nothing prohibiting a layer 4 resource from referencing a layer 5 resource, but this is not as common. Given this guideline, it is possible to identify the resources that are likely to be most common across use cases and therefore demand the highest degree of consistency and governance. Further, the framework helps identify the areas where creating new FHIR resources is the highest priority. It is generally a higher priority to create FHIR resources in the higher layers (layers 1, 2 and 3) than it is to create FHIR resources in the lower layers (layers 4 and 5) because the higher layer resources will provide the greatest value across the largest number of use cases and stakeholders. This is not to say that the business transactions needed for the higher layers are not important, it’s just that they are not as common across the whole healthcare space. 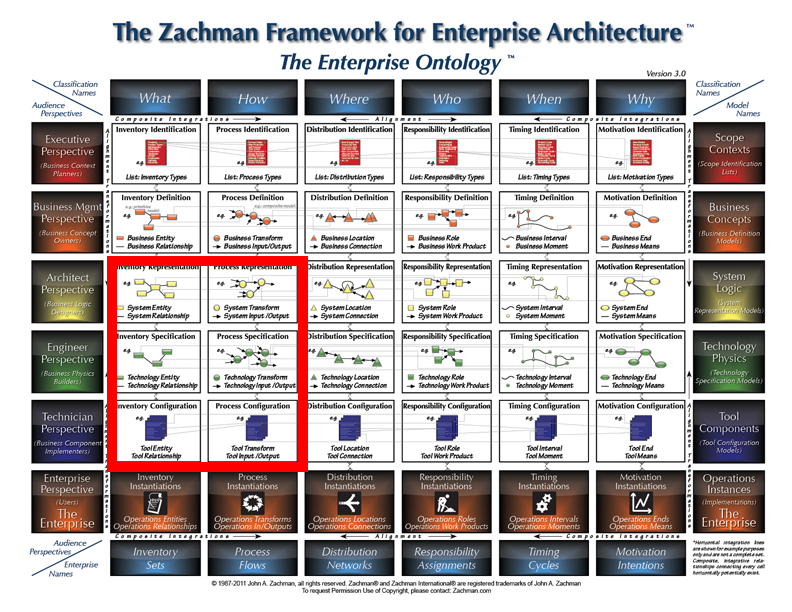 The 6th layer of the framework are not actually resources. Profiles and Graphs are extensions of resources or resource compositions that continue the progression through the FHIR Composition Framework. They provide additional contextualization required to satisfy certain use cases. The framework is further elaborated in the FHIR Resource Considerations page . Another useful tool for visualizing how FHIR resources are organized relative to each other can be found using the Resource Reference Visualization tool on clinFHIR . iServeSystem – methods that expose or enable system behaviors. Additional details on the FHIR APIs can be found at the FHIR RESTful API and the Operations Framework. As mentioned, FHIR resources are optimized for stateless transactions with RESTful APIs. Although this is not the only way FHIR resources can be used, these types of transactions are the only ones with defined interfaces and behaviors in the FHIR specification. 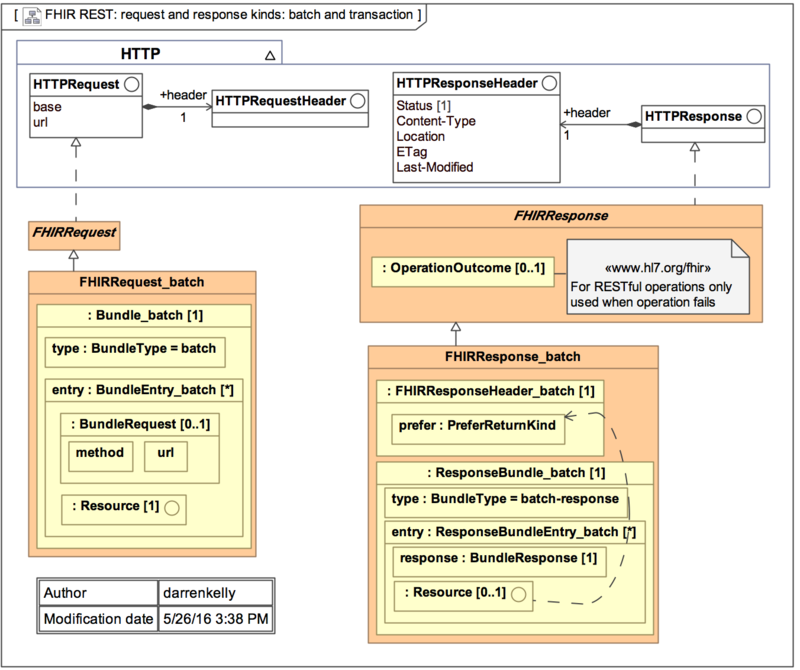 FHIR transactions follow a simple request and response transaction pattern. The request and response can be for a single payload or can operate as batch. The payload or a request and response consist of a header and the content of interest. See diagram below for details. (section to be filled out) (but see Security in the meantime). 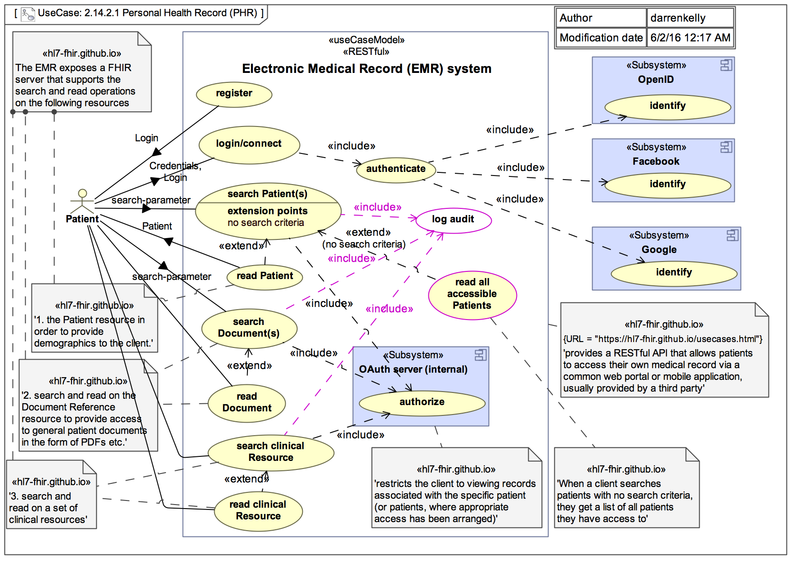 For illustrative purposes, the following diagram depicts a simple use case of a patient accessing their personal health record (portal) enabled by an underlying electronic medical record (EMR) system. 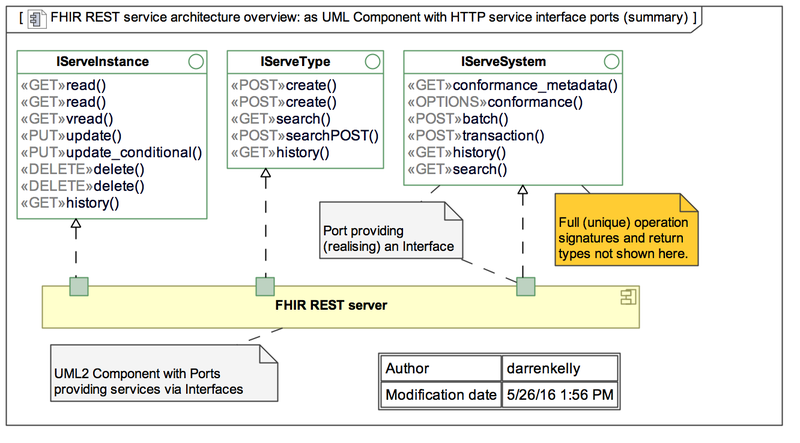 The EMR plays the role of the FHIR server in this example. Although this example use case is very simple, more complex transactions using a combination of GETs, PUTs and DELETEs against resources and metadata can be envisioned. However, the exact details of these use cases including which methods are used, the orchestration of methods and the specific resources involved are outside the scope of the FHIR specification. Resource Consistency and Granularity – there is nothing intrinsically prohibiting one resource from duplicating the same information as another resource. Further, there is nothing prohibiting resources with the same information from defining and modeling the data elements differently. HL7 has a number of processes to ensure that resources are consistently designed, but the question is when to be consistent within the specification, and when to be consistent with the real world practices of healthcare - these are sometimes in conflict with each other. Resource granularity is a related potential problem as there are variations in the size, complexity and comprehensiveness of the existing resources. Further, the degree to which the FHIR specification can impose consistency is limited to how much agreement can be gained across various communities. While the Implementers Safety Check List and the Considerations for FHIR Resource Considerations provide guidance and promote consistency, rules for achieving complete consistency of both content and granularity amongst resources are neither completely defined nor completely enforced. Considering that FHIR is still a new and emerging standard, an over-abundance of constraint and rigor has been avoided to maximize initial adoption. Further, there is a natural tension between consistency and an architectural virtue and the practicalities of supporting the real practice of health care. Considering that FHIR ultimately is a reflection of the health business processes it supports, FHIR will always carry forward some of the data discrepancies, inconsistencies and gaps that are present in the practice of healthcare across different organizations and practitioners. Nonetheless, the issues of resource consistency and granularity is a topic that gets considerable ongoing discussion, and may change as FHIR approaches a final normative standard and as FHIR adoption approaches a level where more control is warranted, or more information/process consistency emerges in the existing healthcare systems. Resource References – there are currently a lack of strict rules for what resources should be referenced by other resources and under what circumstance. There is potential for ambiguity, duplication, inaccurate and/or conflicting information communicated by a resource graph (a collection of linked resources). Imagine the scenario where Resource Type A (e.g., procedure) references Resource Type B (e.g., encounter) and Resource Type C (e.g., patient), and Resource Type B (e.g., encounter) also references Resource Type C (e.g., patient). In this scenario, is a reference to Resource A to Resource C meant to provide the same information as the reference from Resource B to Resource C? If so, is this duplication of information problematic? Note that this is not unique to FHIR - it is an innate property of information systems. If an actual instance of A, and the B that it references, reference different instances of Resource C (e.g. the procedure references patient X and an encounter for patient Y), how does the system know that the references are intentionally different versus an error or data anomaly? The problem is that there is limited ability to describe the intent of the reference which leads to the possibility of ambiguity and error. 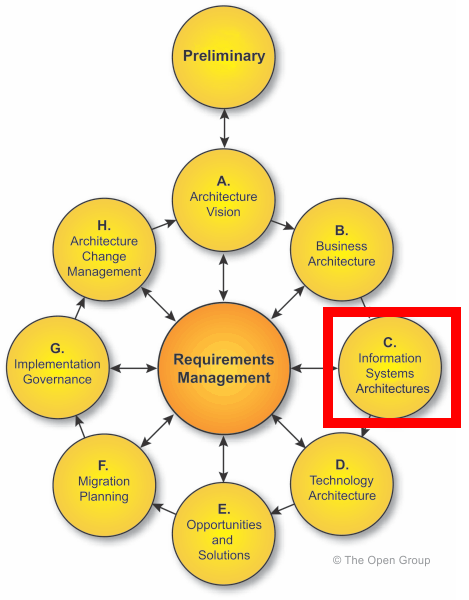 The Linkage resource can be used to help with this problem, but additional capabilities may be considered in the future to allow systems to address referential integrity. Conditional Semantics – Currently, the constraints for element definitions including things like data types, value sets, optionality and cardinality are defined at design time with limited consideration for variable run-time semantics. Imagine the scenario where the value of Data Element Y (e.g., “intolerance type”) is constrained differently depending on the value of Data Element X (e.g., “causative agent”) in a given instance of a resource. For example, if the instance of an Intolerance Resource has the “intolerance type” data element populated with “food intolerance”, then “causative agent” should be constrained to only valid values for this value set (e.g., valid foods instead of medications or environmental agents). Tools for addressing deep semantic consistency in this regard are only gradually developing. Business Rule Enforcement and Validation – As governance increases and more resource rules are defined, it may be advantageous to have a resource validation tool that checks for things like resource consistency, duplication, referential integrity, circular or nonsensical references, and other defined and approved validation rules. Once rules are agreed to, this level of automation can help address the other issues outlined above. These kinds of facilities are planned for the future.